Most verbal humour depends on some kind of mismatch between two words or phrases and the funny or unexpected resolution of this incongruity. My last post focused on a type of grammatical ambiguity that allows two conflicting analyses of a sentence, one of them ridiculous. More often, though, humour and ambiguity play on the multiple meanings of words and phrases, or on the clash between different phraseological interpretations. The article described how Bristol schoolchildren gathered at the headquarters of Avon Valley Railway to stage a re-enactment of the wartime evacuation of children from urban centres in the east to the Bristol countryside. The idea was to give modern kids a taste of what it was like for those other children to be suddenly taken from their homes and evacuated by steam train to an unknown rural environment. They arrived in time to catch the midnight train to London. Film crews travelled back in time to uncover historic facts on Coventry’s watch-making industry. 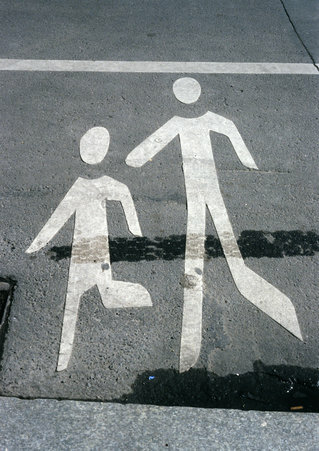 Road signs advising motorists to slow down, like SLOW CHILDREN AT PLAY and SLOW WORKERS AHEAD, are an easy target for deliberate mis-reading arising from conflicting ways of chunking the words: slow children + at play rather than the intended imperative slow + children at play. In practice, of course, the layout of such signs disambiguates them: SLOW is usually in a larger typeface and stands on a separate line. She wore her shoes out dancing in the street. The obvious reading of this sees wear out (sense 3) as a phrasal verb, while the less likely interpretation involves ellipsis – ‘she wore her shoes (when she went) out dancing’. Naturally, the possible ambiguity is resolved in the wider context. Another kind of double meaning applies only to spoken English; it exploits the unrelated meanings of words that sound the same but are spelt differently, i.e homophones like their/there/they’re or sew/sow/so. Meat from whales is being shipped to Japan and sold illegally. This momentary confusion can be explained in terms of lexical priming. The juxtaposition of from Wales and to Japan reinforces my erroneous ‘two countries’ interpretation. Moreover, the noun group meat from whales is at odds with the way we normally talk about meat: we don’t often say ‘meat from lambs’ or even ‘meat from horses’, but lamb and horse-meat. And finally, primings vary according to an individual’s life-long encounters with a word: I have strong personal and family connections with Wales but only a vague and theoretical relationship with whales. So there was no contest: this mysterious item had to be about Welsh meat. Except that it wasn’t. In English, ambiguity also springs from homonyms – words that have the same spelling and pronunciation but different meanings. Road signs, again, often employ disconcerting homonyms (not intended to be puns) such as MAJOR WORKS AHEAD (to which the response can only be Does he?) and the oft-cited CAUTION – HEAVY PLANT CROSSING, which unfailingly invokes the mental image of a huge plant tiredly dragging its dusty leaves as it slowly makes its way across the tarmac. Everyday language is full of humour, if you want to find it. Guess who they got to write this blog post? Muggins! How does ‘impact’ impact you?